One of the worst things about being an addict, other than the damage it does to one’s physical and mental health, is how much of a toll it has on their family. They’re the ones with the clearer conscience, so they are usually the ones left helpless as they watch their beloved family member fall further and further into addition, and have to deal with the emotional consequences of losing their son, brother, sister, cousin etc to the disease. It’s a notion that has inspired not one but two films as of late; first, we had Beautiful Boy which between that film and the one we’re going to be talking about today received the most attention this past awards season, largely for Timothée Chalamet’s excellent portrayal of a young drug addict; and now, we have Ben Is Back, a movie that didn’t receive quite as much love as the other film, but for my money it’s the stronger of the two as it adopts a much more thoughtful and sometimes hard to stomach approach to a parent’s unconditional love for their child, and it also has two extremely powerful lead performances that are about on the same wavelength as Chalamet and his co-star Steve Carell, but are no less impactful because of it. Set over a course of one day, it’s Christmas Eve and Holly (Julia Roberts) is preparing for a wholesome family experience; however, things are thrown for a loop when she unexpectedly sees her son Ben (Lucas Hedges) standing in her driveway, home from rehab after being there to treat his drug addiction. Though Holly welcomes him with open arms, the rest of his family, including sister Ivy (Kathryn Newton) and step-father Neal (Courtney B. Vance), are much more apprehensive about his presence, and soon Holly strikes a deal with Ben that, in exchange for spending Christmas with them, he never leaves her sight. That starts to become difficult when, later on, a disturbing family incident occurs which prompts both Holly and Ben on an all-night journey together, where they both confront the horrifying realities of Ben’s past addiction, and have their loyalties to each other tested. The film is written and directed by Peter Hedges, who funnily enough also happens to be the father of its young co-lead; however, while it’s beneficial to have his own dad behind the camera, for Lucas Hedges it is no walk in the park as he is still coupled with some incredibly difficult material to work with, not to mention being asked to play a character with extraordinary layers as he battles his own inner demons for his and his family’s sake. He pulls it off beautifully, playing around with his character’s vulnerability and deep feelings of regret to give a harrowing portrait of a young addict that’s alarmingly real; as a bonus, he also has some exceptionally strong support from Julia Roberts, who is fantastic as the mother who’s just as unwilling to admit her own faults – including having a little too much good faith in her son, even when he admits upfront that she shouldn’t trust him under any circumstances – but isn’t also afraid to inflict her own sense of tough love (in one harrowing scene, she drives him to a cemetery and forcibly asks him to tell her where he wants to be buried; and in one amazing scene, she brutally scolds the dementia-ridden doctor who gave Ben the painkillers he would later become addicted to following an accident). It’s one of her strongest performances in years, and for young Hedges it’s yet another compelling performance that puts him in extremely good faith for a strong and prosperous future career. It’s a movie that takes you through a rough depiction of the harsh realities of drug addiction, especially how it can irreparably ruin lives and relationships with friends and family. None of the older members of the family, aside from Roberts’ Holly, want anything to do with Ben at this point in time, as they’re not ready to be around him after all the misery he’s caused them, a sad but identifiable statement which speaks volumes to how much he must have seriously messed them around, as addicts unfortunately tend to do; meanwhile, as Ben and Holly go on their journey together during the second half of the film, some disturbing truths are unearthed including a very alarming past relationship with one of Ben’s former school teachers, and how Ben feels permanently guilty for the death of his former girlfriend who he got addicted to drugs. It really doesn’t shy away from how much this sort of thing can ruin so many lives, and it makes a powerful statement about the ideas of forgiveness and unconditional love in this kind of situation, while also not shying away from the naivety that comes with those themes; it makes for uncomfortable, but necessary, viewing which leaves a more sizeable dent than Beautiful Boy did, for its more powerful depiction of the topic alone. There are minor things that don’t entirely work about the film, including a slightly contrived plot device that launches the two lead characters on their journey in the second half, and a conclusion that a little too abrupt after all of its build-up, but overall it doesn’t detract from the powerful statement made here by the filmmakers and these actors, who band together to deliver a compelling and exceptionally performed movie about a very real, and very damaging, lifestyle choice. 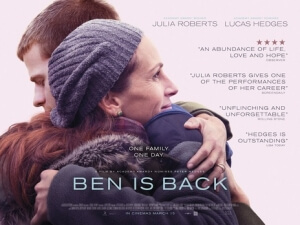 Ben Is Back handles the difficult topics of drug addiction and the unconditional love from a parent to their child in a thoughtful and compelling manner, and is boosted by two excellent lead performances by Julia Roberts – in some of her strongest work in years – and Lucas Hedges, the latter of whom has the benefit of working with their father Peter Hedges as both writer and director but thankfully does not use that as a means to play it at all safe.